Aspen is my most affectionate Min Pin. She loves to cuddle and wants to befriend everyone she meets. Aspen is an amazing athlete and truly fearless when running her backyard agility course. Always eager to play Frisbee, she performs fancy flips in the air while enjoying her favorite game. Aspen seems too good to be true, right? Well, truth be told, Aspen has issues. Aspen is the noisiest of the crew, and at times, her incessant barking has me at my wit’s end! At home, she is the Min Pin who needs the most management. During her barking frenzies, I attempt to distract her by redirecting her attention elsewhere. Fortunately, food is a great motivator! Aspen shows a different side of her personality when out in public. Her leash behavior is far superior to my other Min Pins. Aspen walks politely and remains calm, even when people and/or dogs are spotted. If anything, Aspen will whine to go and greet those she sees while out and about. Usually, I cannot give in to her request because Malibu is walking with us and likes to keep distance between herself and other dogs/certain individuals. Aspen did not always behave appropriately in public. Years of desensitization and counter-conditioning helped Aspen overcome many of the reactive tendencies that were present when she was younger. Although behavior modification continues to be a key component of my dogs’ rehabilitation program, it is not the only method that I have used in an effort to help my dogs. 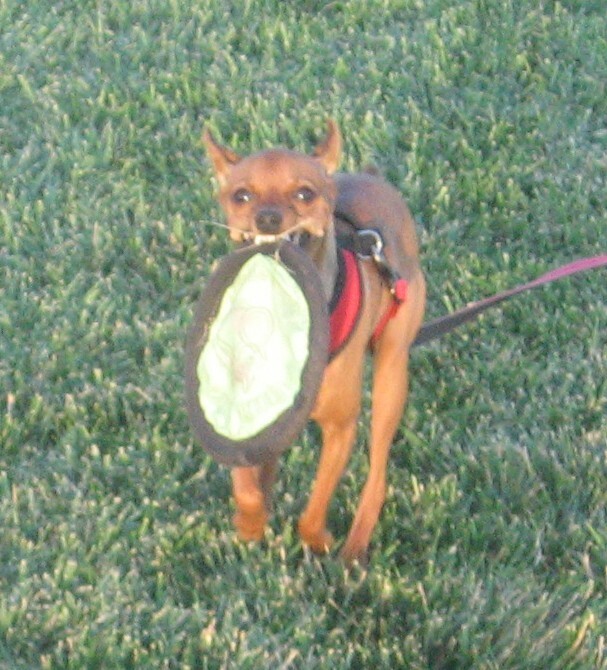 While researching different strategies for my Min Pins’ reactivity, I came across Tellington Touch. Tellington Touch, or TTouch as it is commonly referred to, is a unique, force-free approach that addresses specific physical and behavioral needs of pets through the use of TTouches, Leading Exercises, and a Confidence Course. 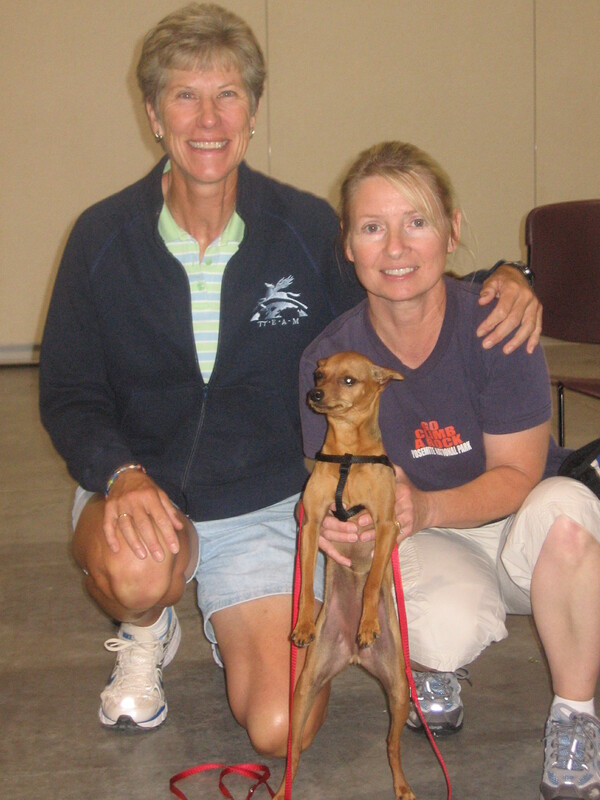 In July 2010, Aspen and I went to Ft. Collins, CO to attend a TTouch workshop. I had met the presenter, Kathy Cascade, a few months earlier while she was conducting a training seminar here in New Jersey. I chose Aspen to accompany me since she is my Min Pin who can best handle the stress of traveling and being around other dogs. At the workshop, I learned how to apply a bodywrap to calm Aspen. 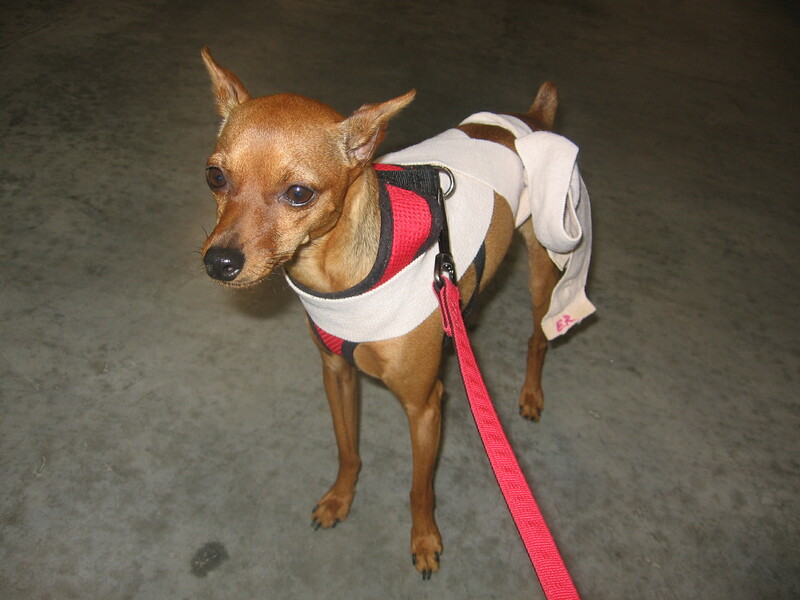 Aspen was selected to be the demo dog for the Thundershirt. 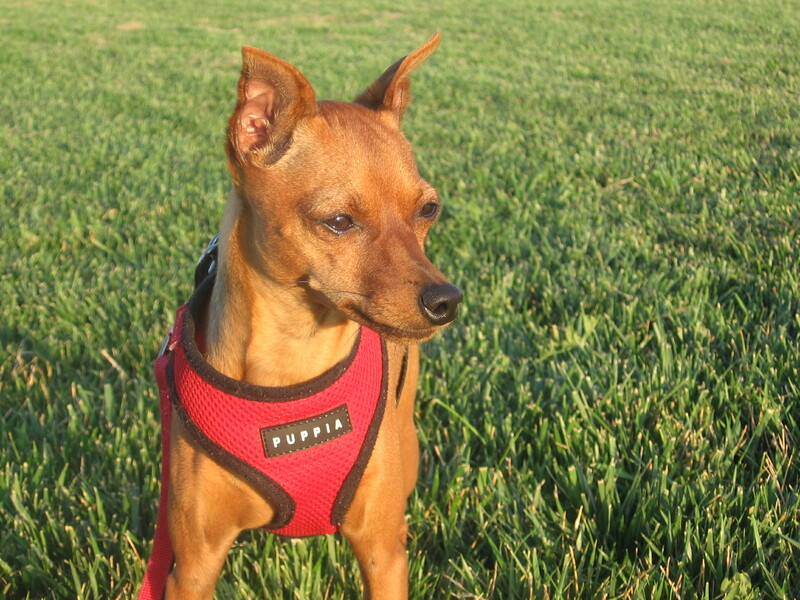 The TTouch workshop was an enriching experience that provided me with fresh ideas to use with my reactive Min Pins. 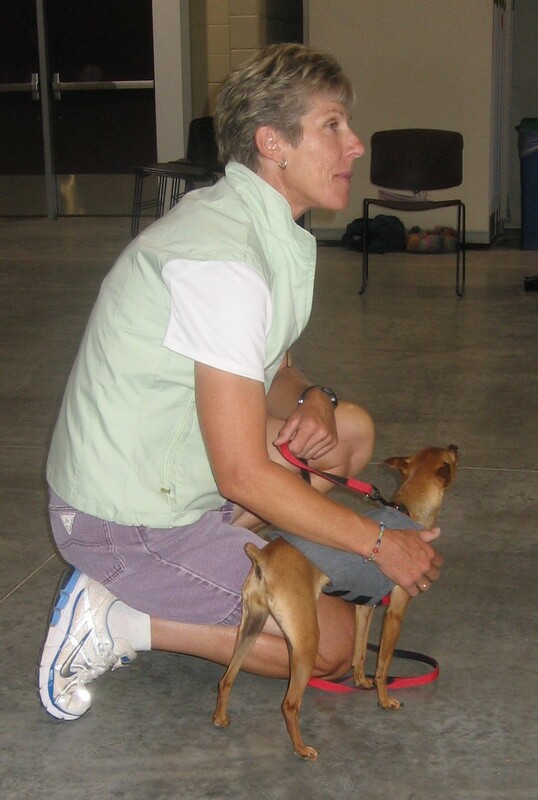 Kathy is an experienced instructor whose caring nature is evident as she strives to assist her students and their pets. Kathy’s calm and patient nature provides dogs with a sense of security as she works with them on their individual needs. While discussing Aspen’s penchant for barking, Kathy helped me see the situation from a different point-of-view. She reminded me, “Aspen is just barking.” That statement may be the single most important piece of information that I took away from the workshop. Yes, barking can be very annoying (I am hearing it now, as I type! ), but there are other canine behaviors that make my situation seem like a picnic in the park. I met a fellow workshop participant who had a dog with such severe aggression that she was considering euthanasia for her pet. Considering her story, my problems are nonexistent. While in Ft. Collins, Aspen enjoyed a game of Frisbee at Fossil Creek Park. In addition to over-the-top barking at home, Aspen has a conflicted relationship with Malibu that has escalated over the past couple of years. Unprovoked, Aspen will intimidate and threaten Malibu for no apparent reason. Aspen will growl, lunge, and pounce on Malibu without warning. A visit to a veterinary behaviorist was long overdue, so an appointment was recently scheduled and off we went. The details of our meeting will be the topic of a future post. Aspen has a few character flaws, but the good definitely outweighs the bad. I have learned that the most productive way to deal with her barking is through management. Some dogs just like to bark more than others and Aspen is one of those dogs. As far as tension among the crew, Malibu may never be Aspen’s best bud, but if I can keep the situation down to a dull roar until a solution is found I will be satisfied. Aspen may be a handful sometimes, but at the end of the day when she snuggles next to me and lays her head on my pillow, I am very grateful to have her in my life.